Project Background Bangladesh is a disaster prone country that is affected almost every year by some kind of natural disaster, On November 15,2007 several districts of Bangladesh have experienced in unprecedented and unexpected cyclone SIDR that severely hit the south and south-west costal region of the country. Cyclone SIDR has destroyed human lives, livestock, standing crops, dwelling houses, fisheries both aquaculture and capture fisheries. The SIDR caused the loss of lives and properties like fishing boats/ fishing nets and fingerling. The many poor fisherman’s were exclusively dependent on these fishing activities for their livelihoods. 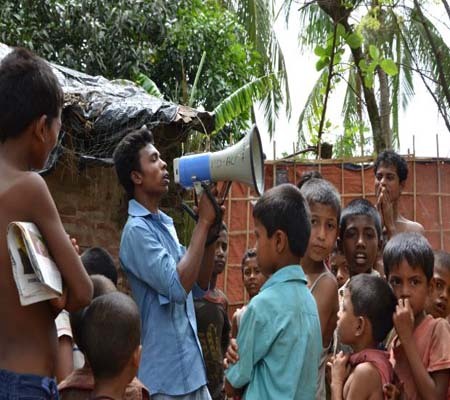 It is reported that losses to the livelihoods and assets of some 2 million rural families in the south-west of Bangladesh (30 districts were affected of which 13 severely affected Upazilas in 6 districts).In addition, there was a huge loss of houses, crops, cattle, trees, and other livelihood assets. Reports mentioned that 43,146 acres of private pond/gher were severely damaged due to the tidal surge, contamination of water bodies and ponds with fallen leaves/bushes and other rotting material, oxygen depletion, destruction of pond dykes and boundary walls and shades. The huge losses caused by cyclone SIDR in the fisheries sector (capture fishery and coastal aquaculture) are most evident in the coastal areas and more specially with beneficiaries as well as artisan fisheries. Without having other alternative means for sustaining their livelihoods these people are leading very miserable lives. The Government of Bangladesh (GoB) agreed, with development partners, that an integrated, multi -pronged approach is required for the economic recovery of the affected areas and for the reconstruction or replacement of destroyed physical assets, to ensure the protection and livelihood rehabilitation of communities living in those areas. The Emergency 2007 Cyclone Recovery and Restoration Project (ECRRP) Year 2 has been focusing on the critical medium to long-term restoration and rehabilitation needs as identified in the world Bank/GoB Joint Damage Loss and Needs Assessment. The World Bank has provided financial support to Bangladesh Government with the objective of long term restoration and rehabilitation needs of the cyclone affected fisheries involved in pond aquaculture. Voluntary Organization for Social Development (VOSD) has signed an agreement with FAO the implement the project “Identification and facilitation of Training of Beneficiaries and Distribution of Aquaculture Inputs’’ under ECCRP (Aquaculture Sub component). The project is concentrated in the worst Sidr cyclone affected 13 Upazilas in 6 south-western districts namely Bagerhat, Barguna, Patuakhali, Pirojpur, Jhalakathi and Barisal. The project development objective is to facilitate the recovery from damage to livelihoods in the agriculture, fisheries and livestock sectors and to rehabilitate the rural livelihoods as well as restore the economic growth through support to three sub-sectors. In the ECCRP (Aquaculture Sub component).it is proposal to recruit one NGO in aquaculture to carry out specific activities of the project. services would be 12(twelve)months. Objectives of the Project Overall Objective: The overall goal of the project is to facilitate the smooth implementation of the ECRRP (Aquaculture Sub component) to rapidly rebuild the livelihoods, dignity, and food security of the worst-affected poor pond farmers through restoring aquaculture activities in 13 Upazilas of 6 districts in Barisal and Khulna Divisions.